50th Annual 300th Engineer Combat Battalion Reunion, June 1 - 4, 2006, Dallas, Texas. Don Richter, left, and Robert Leyva (son of Joe Leyva) on the right. 50th Annual 300th Engineer Combat Battalion Reunion, June 1 - 4, 2006, Dallas, Texas. Norman Webb on the left. 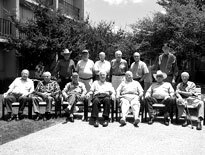 50th Annual 300th Engineer Combat Battalion Reunion, June 1 - 4, 2006, Dallas, Texas. Warren Chancellor on the left. 2007 reunion. The men of the 300th.